Linking up with Kori at Blonde Episodes for Fashion Fridays with a few of my favorite resort accessories. I think you could go on a cruise for the same price as that clutch and definitely for the shoes. Which would you choose? Have a great weekend! I posted the same Spade purse today!! <3 <3 <3 I need it stat! Oh geez! LOVVEE them ALL! Why so spensive!? I love, love, love that Kate Spade clutch! Boats + Bags. An unsinkable combo. My favorite is the Miu Miu Glitzy Wedges....to die for!! Found you via Blonde Episodes Fashion Friday. New follower. Love the Tory Burch cuff! So adorable! New follower by the way and love your blog! Literally just saw all three at Nordstrom and whined about how bad I needed them--especially the clutch!! Great minds think alike!! That clutch. Oh my gosh. I must have it! Nautical heaven! 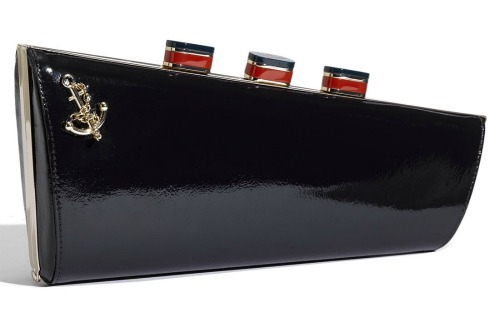 That Kate Spade clutch is SO creative! They have such an awesome design team there; I am always inspired by their unique touches. 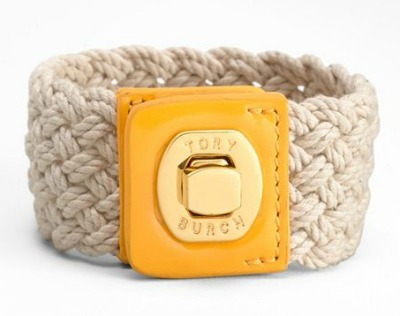 I ADORE the Tory Burch bracelet....must have! That Kate Spade clutch is adorable. Makes me crave summer sailing! Love that clutch! Kate Spade always seems to top herself with adorable things! Could Kate Spade have made anything cuter. Geez. That thing is precious! I am loving that cuff! !